Willem Van de Velde the Younger was a the Dutch marine painter. He emigrated to England with his father in 1674, both were employed in the service of King Charles II. 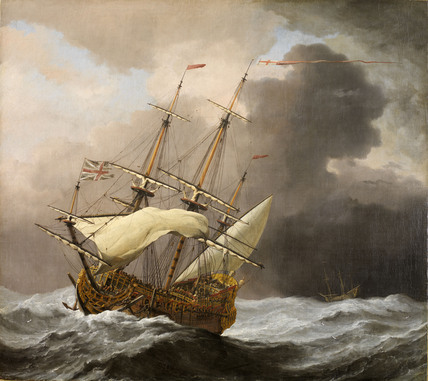 The accurate depiction of the ship enabled it to be identified recently as the seventy-gun galleon the Hampton Court built for the King's first naval fleet. A drawing of the Hampton Court by Willem the Elder (1611-1693) is in the collection of the National Maritime Museum, London. Purchased with the aid of the National Art Collections Fund, 1972.